The South China University of Technology (SCUT) is a leading educational institution in China. It is a public research-intensive university directly governed by the Chinese Ministry of Education. Located in the city of Guangzhou, a thriving metropolis in South China, the university today covers a total area of 391 hectares, consisting of three campuses: the Wushan Campus, the University Town Campus, and the Guangzhou International Campus. The university was formerly known as the South China Institute of Technology, which was first founded in 1952 by merging the engineering schools and departments of several major universities and polytechnic institutes from five provinces, including Guangdong, Guangxi, Hunan, Hubei and Jiangxi. The reorganization, at the time, brought engineering faculties with the strongest academic strengths in the central and southern China together in Guangzhou. The predecessors of this new institute shared long histories of developing modern higher education and scientific research, especially in training students of engineering and technology. The outstanding tradition dates back to the early 20th century, when modern democracy and science were emerging and developing quickly in Guangdong province. In 1960, it was selected by the state as a National Key University. In 1981, it was authorized by the State Council as one of the first institutions in the country to confer doctoral degrees and master’s degrees. In 1988, the South China Institute of Technology was renamed the South China University of Technology. In 1995, SCUT was listed in China’s “Project 211”, a national endeavor aiming at strengthening top institutions of higher learning as a priority for the 21st century. In 2001, SCUT was listed in “Project 985”, which at the time was the country's most significant educational project for funding world-class universities. In 2016, SCUT was ranked the world’s top 300 universities by the Academic Ranking of World Universities, with its engineering placed at the 22nd place. According to Clarivate Analytics’ Essential Science Indicators, SCUT has nine subject areas ranked within the global top 1%, including chemistry, materials science, engineering, agricultural science, physics, biology and biochemistry, computer science, environment and ecology, and clinical medicine. Then in 2017, it was chosen into China’s “Double World Class” project as a Category-A University. After over 60 years of development, SCUT has become a multi-disciplinary university, merging science, engineering, business management, arts and social science, medicine and other disciplines into one integration. Since its founding, it has educated over 380,000 graduates at all levels. Large numbers of SCUT alumni have made key contributions to the country and the world, especially in economy, technology, and education. Since its establishment in 1952, SCUT has developed into a major comprehensive university that offers multiple disciplines of study including science, engineering, business, management, liberal arts, law, biomedical science, and art design. It is currently composed of 28 colleges offering 82 bachelor degree programs, 118 master degree programs, and 107 Ph.D. programs. Seven subjects—Light Industrial Technology and Engineering, Food Science and Engineering, Urban and Rural Planning, Materials Science and Engineering, Architecture, and Chemical Engineering and Technology— are ranked in the top 10 among Chinese universities. ESI ranks six disciplines in the top 1%. Material Science, Chemistry, Engineering, Agricultural Science, Physics, and Biology and Biochemistry comprise this list. Since 2012, SCUT has held a place in the top 500 of QS World University Rankings. In the 2016 QS World University Rankings, South China University of Technology was ranked in top 400 integrally, top 50 in engineering, top 100-200 in chemistry, and top 200 in Mathematics and Computer Science. US. News & World Report published 2016 Best Global Universities, and SCUT ranked 395, with Agriculture science, engineering, and chemistry ranked in 40, 41 and 69 respectively these fields. PS: Please check your room facilities carefully, report any broken items or items that are out of order to the reception staff and mark on the Check-in form. The Service Department will later get them repaired. 4. Internet connection, RMB 50 per month with a connection fee of RMB 100. 6. Washing Machine(First floor of the dorm): RMB 3 / barrel. 1. Visitors shouldn’t stay overnight in the dormitory, please leave before 23:00. 2. Please do not make noise or play music after 23:00. 3. Please get your door card and key upon your arrival at the duty room in the dormitory. Keep them well and you need to pay fees as compensation if you lost them. 4. Please take care of the hostel and dormitory properties. Keep them well as you’ll need to pay fees as compensation if you break them accidentally. 5. Student cards can be purchased at office 320208 in Building 32. 1. The international student dormitory on the south campus. 2. The student's office of the School of International Education (SIE) is in Room 208, Building No. B1 Office hours: 8:50am to 12:00pm, 13:50pm to 17:00pm, from Monday to Friday. For students office of the School of International Education (SIE) is in Room 208, Building No. B1 Office hours: 8:50am to 12:00pm, 13:50pm to 17:00pm, from Monday to Friday. For any inquiries, please contact 39381020. 3. Each dorm room is equipped with an internet connection. To connect to the internet in your room, please go to the Internet Administration Office which is located on the first floor of Building D1, Internet Center. 1. You can purchase mineral water at the duty room at RMB 10yuan / barrel. 2. Visitors shouldn’t stay overnight in the dormitory, please leave before 23:00. 3. Please do not make noise or play music after 23:00. 4. Please get your key card upon your arrival at the duty room in the dormitory. Keep them well as you’ll need to pay a fee as compensation if you lose them. 5. Please take care of the hostel and dormitory property. Keep them well as you’ll need to pay a fee as compensation if you broke them accidentally. 6. Dining cards can be purchased at Room B1-208. (1) Accommodation Reservation Service is not available. The rule is: First Come, First Served. (2) Students may choose to live off campus. Note that international students have to register at the local police station within 24 hours of moving into off-campus housing. (3) Students should pay the fees on time and in full in the registration time. It is suggested that students apply for one credit card in China’s banks first and then pay by card. Usually, deferral application is unacceptable. (4) The Admission Letter will become invalid if the applicant is holding the expired visa in China. (5) SCUT can only provide the first two years’ accommodation for self-support international students. (7) The tuition and accommodation fees are nonrefundable if a student withdraws from the program. 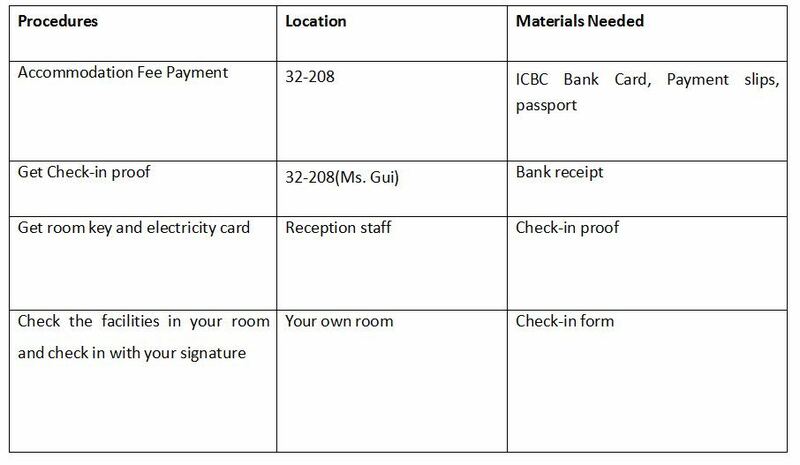 We estimate that a single student living in Guangzhou will need RMB13, 000-15,000 for living expenses annually in addition to the tuition and accommodation fees. This amount includes food, clothes, books and travels. You are required to join the Health Insurance if you study for more than six months at SCUT. 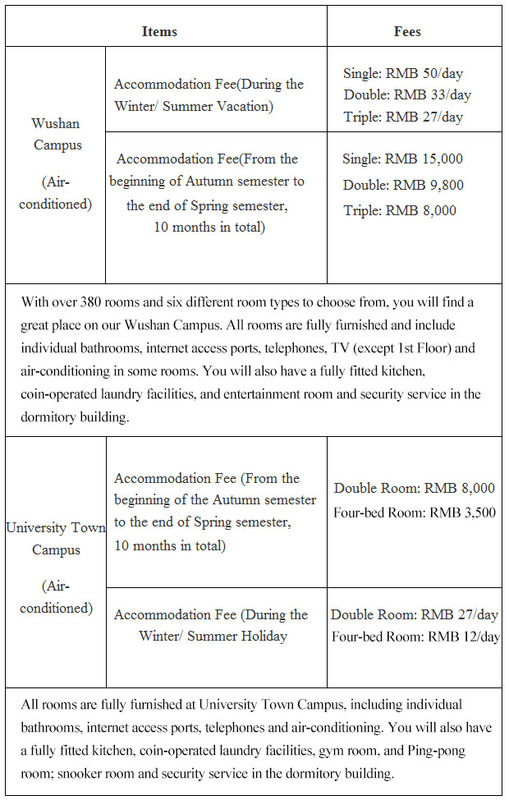 The insurance premium is 400RMB/semester or 800RMB/year. If you have joined another similar insurance plan in your home country or in China, please present the related documents when registering. Scholarship awardees the of Chinese government are NOT required to pay for the insurance. Foreign currency such as Pound, HK Dollar, US Dollar, Euro, Japanese Yen, Canada Dollar, Australia Dollar, etc. can be exchanged to RMB at banks. There is an Industrial and Commercial Bank of China opposite to the International Student Dorm. And another Industrial and Commercial Bank of China, Bank of China, China Construction Bank and Agricultural Bank of China can be easily accessed in Wushan suburb just outside the north campus.